Karibea hotels are ideal for an unforgettable trip in the heart of the Caribbean. 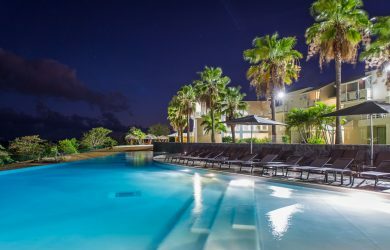 Whether you are traveling with family or friends, business travelers or merry adventurers, our hotels in Martinique and Guadeloupe invite you to experience the riches and beauty of their islands in a warm and welcoming atmosphere. Lush gardens, bougainvillea with vibrant colors, palm-fringed beaches, sparkling sea, sun and dazzling landscapes make up the idyllic setting of your stay among us. Our 2 and 3 star establishments have more than 800 hotel rooms in Martinique and Guadeloupe. In order to make your stay more enjoyable, you will be offered breakfast, half-board, a la carte meals or rental packages. 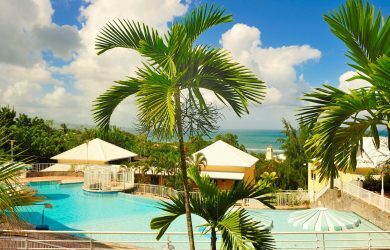 In Sainte-Luce, Martinique, The 3-star Karibea Sainte-Luce Hotel invites you to open the doors of one of its 3 establishments: the Amandiers and Amyris hotels as well as the Caribia residence. Three swimming pools, two restaurants, a bar, a wellness center, a shop and many other services await you for moments of relaxation. At the Pointe du Bout, 3 Ilets in Martinique, succumb to the charms of the Karibea Camelia Residence 2*, ideal for travelers looking for freedom with its air-conditioned studios and equipped with kitchenette. In Tartane, Martinique, the Karibea Goelette Residence 3* offers studios and apartments, spacious and comfortable, with a stunning view of the sea or the surrounding nature. In Fort-de-France, Martinique, our business establishments, the 3* Karibea Valmeniere Hotel and the 3* Karibea Squash Hotel, enjoy a privileged location in the immediate vicinity of the island’s business district. Not far from the airport, the Karibea Valmeniere Hotel offers 120 bright and modern rooms and suites, the Karibea Squash Hotel, labeled “Quality Tourism”, will delight you with its decoration and its 104 elegantly furnished rooms. 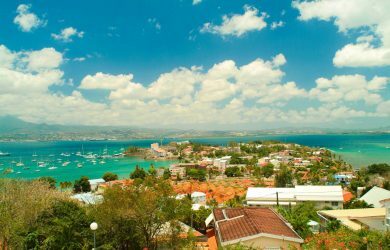 In Guadeloupe, in Gosier, await you the Karibea Beach Hotel and its three establishments: the Clipper Hotel, Salako Hotel and the residence Le Prao. 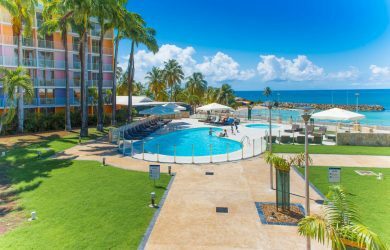 3 * hotel complex spread out over a vast domain with paths strewn with bright flowers, it is the holiday resort of your seaside holidays in the Guadeloupean Riviera.